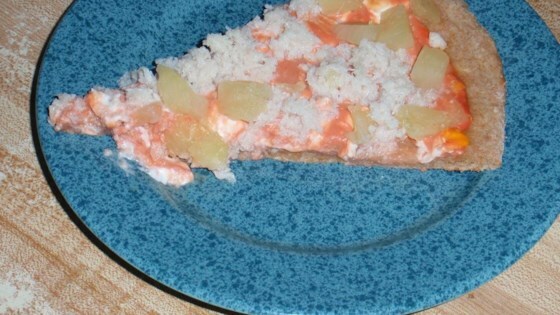 "This is a nice and easy pizza to make with unusual, but yummy flavors. You will be addicted!" Preheat the oven to 400 degrees F (200 degrees C). Grease a pizza pan or cookie sheet. Spread both cans of dough out to cover the prepared pan, sealing any seams. Spread a thin layer of pizza sauce over the crust, and dot with cream cheese cubes. Sprinkle shredded crabmeat over, then pineapple pieces. Bake for 12 to 15 minutes in the preheated oven, until the crust is lightly browned. This is delicious!!! I am addicted! This pizza was just average. I added some mozzaerlla to the toppings. This sounded really good, but nobody in my family thought it was anything special. I don't think I'll make this again. I love this combination! It's also good if you add jalapenos! Yummy!